Skipper Charles Caudrelier led his team to victory on the final leg of the race, a 970-mile sprint from Gothenburg, Sweden to The Hague. Incredibly, it marked the first leg win for the team – it couldn’t have come at a better time. Three teams started Leg 11 of the race in a dead heat on the overall leaderboard. The finishing order between MAPFRE, Team Brunel and Dongfeng Race Team at The Hague would determine their place on the overall race podium. Each of those three teams led at various points on the leg and had their opportunities to grab the prize. But it was Caudrelier and his crew who made a bold call on Saturday evening to take a coastal route to the finish, which squeezed them tight against the shoreline and separated from the other leaders by a series of Exclusion Zones. The decision hurt the team in the short term as they tumbled down the leaderboard. But by Sunday morning, with less than 100 miles left to race, weather routing projections had the top boats finishing within minutes of each other. None had been able to break away overnight, despite the significant splits on the race course. 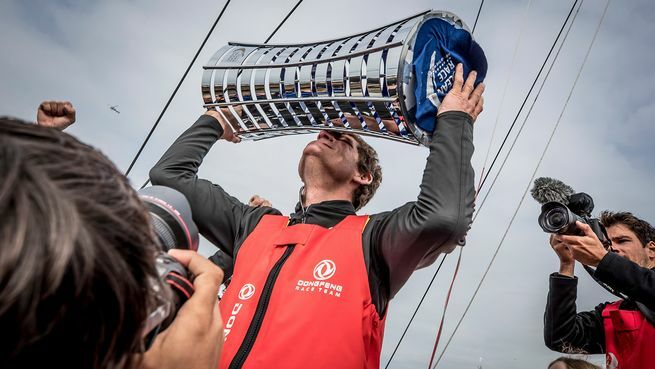 As the teams finally converged again on Sunday afternoon, just a few miles from the finish, it was Dongfeng Race Team, flying down the coast from the north sliding in front of the offshore group, to earn their first leg win, propelling Caudrelier’s team to overall victory. The overall results make this the closest finish in the 45-year history of the race and marks the first win for a Chinese-flagged team. It also means Carolijn Brouwer and Marie Riou were on board as the first women sailors to win the Volvo Ocean Race. Xabi Fernández’s MAPFRE was third on the leg, which put the team into second overall. Team Brunel skipper Bouwe Bekking would have liked nothing more than to win the race for the first time in eight tries with a home finish in The Netherlands. But it wasn’t to be. His fourth-place leg finish left the team in third place overall. Second place on the final leg into The Hague was Dutch skipper Simeon Tienpont and his team AkzoNobel, who had previously secured fourth place on the overall leaderboard. Vestas 11th Hour Racing had already been locked into fifth place on the scoreboard and after a promising start to Leg 11, had a disappointing seventh place finish on the leg. That In-Port Race, scheduled for Saturday afternoon, will determine the sixth and seventh place positions in this edition of the Volvo Ocean Race. Both SHK/Scallywag and Turn the Tide on Plastic finished the Volvo Ocean Race on equal points. The tie-break mechanism is the In-Port Race Series, where David Witt’s Scallywag team currently holds the lead. But Dee Caffari’s Turn the Tide on Plastic is just three points behind and a strong finish on Saturday could lift them off the bottom of the leaderboard. For David Witt, the finish was bittersweet the loss of John Fisher overboard in the Southern Ocean top of mind. The teams will celebrate their accomplishments and take well-earned rest on Monday. The rest of the week will see activities in The Hague building towards the final In-Port Race and Awards Night on June 30.